The University of Munich Hospital’s Großhadern site is working to prevent the multiplication of Legionella in its hot water supply by means of thermal disinfection. To provide legionella-free drinking water, the two-stage AquaProtect-T thermal disinfection system from Alfa Laval is being installed, a system which uses high-performance plate heat exchangers. The first heating stage is used to cool water back to the tap-supply temperature and therefore also serves to provide heat recovery. Circulation is also fully integrated into the disinfection cycle. The target was set as providing the entire clinic with legionella-free hot water. Ensuring hygienic water supply to even the remotest corner of a major clinic is more than simply a question of water temperature. With its total pipe network of approximately 200 km and more than 7,000 tap outlets, the existing drinking water network of the University of Munich Hospital site at Großhadern presented a special problem. An assessment of the installation facilities led to the conclusion that it was no longer possible to exclude the risk of impermissibly high concentrations of the human pathogenic bacterium Legionella pneumophila could no longer be excluded in certain areas of the hot water network. This presented clinic managers with the challenge of undertaking preventive technical measures in terms of the installation and their procedures. “The plan was quite simply to provide the clinic with a permanent supply of legionella-free drinking water,” explains Christian Frank, responsible as Sanitation Manager for the maintenance of drinking water quality. Since 2003, all drinking water heating equipment in the total of twelve technical centres has been successively renewed. Some of the water tanks installed to date have already been replaced with Alfa Laval’s AquaProtect T’ drinking water heat treatment system. 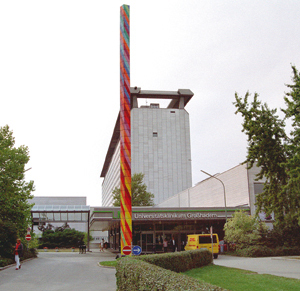 The University Hospital, which is situated on the western edge of the city of Munich, uses a total of 64,000 m³ of hot water annually. The central kitchen takes 20 000 m³ of this, while the remainder of consumption is distributed throughout the 13-storey ward building and operating and treatment areas. However, it was not possible at first sight to establish beyond doubt a clear plan: the installation facilities showed some obstacles which might hamper secure prevention of legionella growth. The clinic complex was built in the 1970s. Pipes of over-large dimensions and a pipe network which over the decades has been expanded and in some cases altered do not give a complete picture of actual flow conditions in the piping. In places, it also remains uncertain whether pipe content is consistently exchanged to a sufficient extent. The possibility that in inaccessible areas such as installation hafts and ceiling suspensions considerable heat loss may occur is also impossible to evaluate. The cooling of water together with low flow speeds and long stagnant periods in piping together constitute an unquantifiable risk, as such conditions can provide optimum conditions for the multiplication of legionella. The next question needing to be addressed therefore concerned the choice of suitable disinfection measures in order effectively to prevent the multiplication and spread of legionella in the clinic hot water network. Chemical processes were, however, discounted in advance, flow conditions in parts of the pipe network being unclear. There was therefore no guarantee that particular sections of pipe would be reached at all by disinfectant additives, or that such substances would not be washed out again before having any effect. The only practicable procedure remaining for consideration was thermal disinfection. Since the pipe network, made of galvanised steel pipes, showed no corrosion occurrence and because the water hardness allows the assumption of a more or less even protective layer, the technical managers of the clinic had no objections to the use of thermal disinfection procedures. One of the first technical centres in which drinking water heating had been switched to the AquaProtect system, provided a quarter of the entire ward building’s drinking water. Where previously six hot water tanks had stood each containing 5,000 l, drinking water was now heated and thermally disinfected in a two-stage system with compact heat exchangers. Cold drinking water flows past two plate heat exchangers in turn; these are made of pure stainless steel. Cold water supply is initially led through a preheating phase. The second heat exchanger is the disinfection stage. On the University of Munich Hospital site at Großhadern, this phase was equipped in terms of the heating aspect with a heating performance of 230 kW. Drinking water leaves this second phase at a temperature of 70 °C and is led into a reaction tank (capacity 750 l), whose internal construction, designed as a stilling section, provides a laminar flow profile. After a period of at least six minutes, the drinking water flows from the reaction tank into the actual storage tank, which holds 5,000 l of thermally disinfected hot drinking water. If hot water is drawn during this period, cold drinking water flows from below into the hot water tank. However, this compensatory flow of as yet untreated drinking water is then sent in the contrary flow direction back into the disinfection phase immediateythermally disinfected water once more flows out of the reaction tank into the upper part of the storage tank. The thermally disinfected drinking water is stored in the hot water storage tank at 70 °C and kept at this temperature. If no hot water is drawn, the storage tank content circulates back to the disinfection phase and is reheated there. The system also has a control system to prevent the nonattainment of the disinfection temperature. If the target temperature of 70 °C is not reached, the drinking water runs through a three-way switching valve and again through the two plate heat exchangers, until 70 °C is reached at the end of the second stage. However, to protect patients and clinic staff from the danger of scalding at the some 6,000 hand basins, 600 showers and approx. 450 laboratory and kitchen sinks, the thermally disinfected hot water is recooled to tap-supply temperature before distribution. For this, the hot water is fed from the storage tank through the first plate heat exchanger. The preheating phase for the cold drinking water thus functions simultaneously as a heat recovery. The entire clinic hot water pipe network, which is designed as the top level of distribution, is also subject at regular intervals to thermal disinfection. Network disinfection can be freely programmed in the installations controls, as well as altered at any time or started on demand when necessary. “The thermal disinfection process runs once a week at night for four hours,” explains Christian Frank. This ensures, both in respect of the installation and procedures, that only thermally disinfected hot drinking water is delivered to the tapping points. However, one aspect of the installation that is difficult to master is the long, ramified circulation network of the 13- storey clinic building. The managers could not guarantee that individual pipe sections of the circulation might hardly ever be reached by the 70 °C water owing to overdimensioning and possible high rates of heat loss. This would entail the danger that water containing live flora might flow back into the hot water preparation system. Measures such as subsequent hydraulic balancing, to avoid cooling of the circulation by more than 5 K (according to the recommendations of the DVGW [Deutsche Vereinigung des Gas- und Wasserfaches – German Technical and Scientific Association for Gas and Water] worksheet W 551), would not be realisable under the prevailing conditions. Therefore, hot water circulation in the AquaProtect T system is not sent back into the tank, but is fed back into the cold water supply before the preheating phase. “Backflows from the circulation network thus also go through the complete two-stage disinfection,” explains Axel Laubach, Alfa Laval product manager. This solves the partly critical problems such as thermal disinfection, permanent heating to 70 °C, recooling as scald protection and circulation disinfection. However, another factor intervenes, which would normally exclude the use of plate heat exchangers: the water hardness of the drinking water supplied to the building connections in Großhadern is of the order of 14 °dH. Nevertheless, the supervisor of the twelve-strong sanitation maintenance team categorically rejects water softening measures of any kind. The complex and ramified pipe network would require numerous decentralised installations; room temperatures in the technical centres are another reason for refraining from extra risk-taking in matters of drinking water hygiene. “We have the problem of limescale precipitation under control,”says Christian Frank. Firstly, the AquaProtect system from the manufacturer Alfa Laval has been equipped with stainless steel plate heat exchangers which are suitable for high water hardnesses. Secondly, the drinking water heating installations are specially constructed as redundant systems – with double heat exchangers mounted and thus with two mutually independent heating and disinfection circuits. This is because operational breakdowns are intolerable, as Christian Frank emphasises: “Clinic operations cannot take any account of hot water supplies having to be turned off for maintenance work.“ So the limescaling of the plate heat exchangers is taken into account in the plan. The monitoring inspections which already take place daily through the technical centres will thus also include the water heating installations. It is easy to recognise from falls in pressure before and after heating phases when decalcification is due. The screwed-together plate heat exchangers are dismantled and lime scale removed from the stainless steel surfaces; the exchangers are then fitted with new washers, disinfected and reinstalled. However, they are only filled and tested for watertightness when the time comes for the decalcification of the other heating circuit. In positioning the heat exchangers, attention was paid to achieving this highest possible exploitation of flow speeds, in order to keep the stagnant period of the water flowing through as short as possible. When dimensioning the drinking water heating apparatus, actual consumption values were applied along with calculated averages for the sustaining of the tapping locations to be served. In the operation of drinking water installations in hospitals, preventive measures against legionella infection are among the most urgent tasks. This requires targeted and effective procedures, in order to prevent the uncontrolled multiplication and spread of legionella in both the drinking water heating installations and in the hot water distribution network. The relevant obligation and the appropriate specifications are given in the (German) Infection Prevention Act (“Infektionsschutzgesetz”, IfSG), the Foodstuffs and Commodities Act (“Lebensmittel- und Bedarfsgegenständegesetz”, LMBG), the Drinking Water Ordinance (“Trinkwasserverordnung” TrinkwV) and the applicable regulations for the planning, construction and operation of drinking water installations. In existing hot water supply installations, unsuitable conditions such as overdimensioned and intricately ramified pipe networks, heat loss and the sometimes low levels of use of tapping points tend to defy these standards. Procedures for the heating of drinking water and its thermal disinfection which heat the drinking water continually to the temperature required for disinfection and include circulation water in this process enable the operator to achieve the necessary operational safety and to protect users from the risk of infection by legionella. Hot water supply to the 13-storey ward building of the University of Munich Hospital’s Großhadern site is kept legionella-free by thermal disinfection.